Coronary artery disease (CAD) is a multi-factor disease. Complement component 3 (C3) plays an important role in the development of CAD. The present study investigated the association between DNA methylation status of C3 gene promoter and the risk of CAD. One hundred CAD patients and 1 hundred age-and gender- matched controls were recruited in current study. Methylation levels in CpG island in C3 promoter were determined by the method of bisulfite amplicon sequencing. 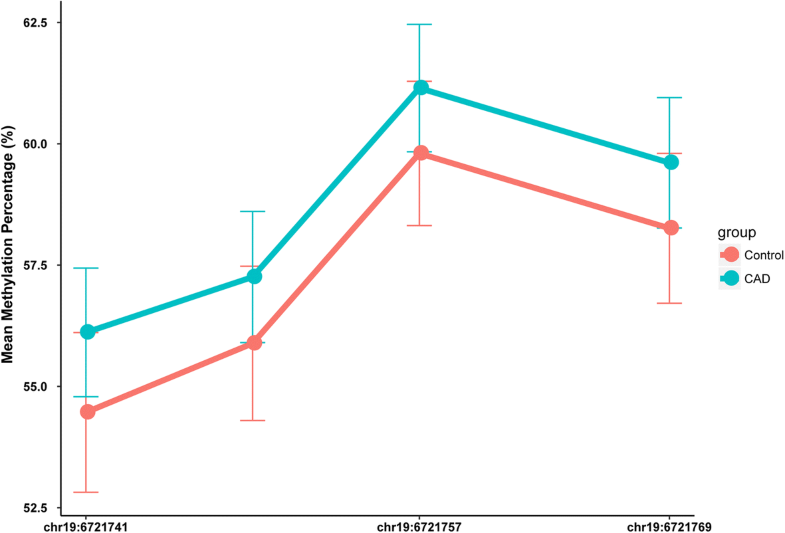 Methylation levels of four CpG sites in C3 promoter were measured. There were no significant difference in methylation level of each CpG site between CAD patients and controls. Average methylation rate was also calculated. No significant difference in average methylation rate was observed between CAD and control groups. Stratified analyses based on EH, DM and smoking status were carried out, no significant association between C3 promoter methylation levels and the susceptibility of CAD was observed. Furthermore, seven haplotypes were established and no significant difference in haplotypes was observed between CAD and control groups. However, our study showed that C3 DNA methylation levels were positively associated with LDL-C levels. Coronary artery disease (CAD) remains the leading cause of morbidity and mortality worldwide. With the rapid aging of the population, increased calorie consumption and decreased physical activity, the incidence of cardiovascular disease in some developing countries will increase steadily in future . The interaction among environmental, genetic and epigenetic factors affects the occurrence and development of CAD, which has been accepted widely . Epigenetic regulation, changing the expression of genes without changing the DNA sequence, plays an important role in the occurrence of various diseases. In recent years, the research on the association between epigenetics and cardiovascular disease was investigated more and more deeperly . Candidate genes and epigenome-wide association studies (EWAS) showed that DNA methylation, the most common and important epigenetic modification pattern, was related to cardiovascular disease [4–6]. Complement component 3 (C3), one of the important components of complement system, is the central molecule of complement activity pathway . C3 is mainly synthesized and secreted by liver and adipose tissues, composing of α and β chains. The C3 gene is located in human chromosome 19p13.3–2. Several polymorphism sites in C3 have been associated with CAD. Previous studies have showed that the activity of C3 was associated with several CAD risk factors , such as essential hypertension, diabetic mellitus and obesity. In 2014, Jiang H et al. found that C3 level was associated with the occurrence and development of CAD . Inhibiting the interaction between C3 and fibrinogen could reduce the cardiovascular events in diabetic patients . The association of C3 methylation and body mass index (BMI) has been previously reported in Spanish population . However, up to now, no study has designed to explore the relationship between C3 promoter methylation and the CAD risk. Herein, we performed this case-control study to investigate whether C3 methylation was associated with the risk of CAD and lipid profiles in a Chinese Han population. One hundred CAD patients (66 males and 34 females, mean age 64.1 ± 10.9 years) and 1 hundred age-and gender- matched controls (54 males and 46 females, mean age 63.1 ± 8.2 years) were recruited from the Department of Cardiology in Wujin Hospital affiliated to Jiangsu University between September 2013 to June 2017. The method of propensity score matching was used to select the subject. All subjects underwent coronary angiography (CAG) examination. The diagnosis of CAD was described in our previous studies . CAD severity was substituted by the number of stenotic coronary artery. CAD patients were divided into three groups according to the number of stenotic coronary artery (one, two and three). The controls were who had angina-like chest pain and also underwent CAG examination in the same period. According to the results of CAG, controls had a luminal stenosis of < 50% in the major coronary arteries. As a result of the destruction of some serum samples, among the 200 participants, only 44 subjects were selected to detect for serum C3 levels, including 31 CAD patients and 13 controls. People with asthma, malignancy, serious kidney or hepatic disease were excluded. Patients taking lipid-lowering drugs in 3 months prior to the study, which might affect the lipid metabolism, were also excluded from the study. The study protocol was approved by the Ethics Committee of our hospital and informed consent was obtained from all enrolled patients. After overnight fasting, venous blood was drawn to detect biochemical data. The methods of detection of lipid levels, including TC, triglyceride (TG), high density lipoprotein cholesterol (HDL-C) and LDL-C, apolipoprotein A1 (Apo A1) and Apo B, were described in our previous studies . Serum C3 levels were detected by radio-immunoassay method. Genomic DNA was extracted from whole blood. The methods were performed as previously described . The quality and concentration of genomic DNA were assessed by gel electrophoresis and Nanodrop 2000 spectrophotometer (NanoDrop technologies, Wlimington, DE, USA). The concentration of DNA was more than 20 ng/μL and the 260/280 absorbance ratio was between 1.8~2.0. CpG islands in the promoter of C3 gene were selected according to the following criteria: 1) 200 bp minimum length; 2) > 50%CG contents; 3) > 0.60 observed/expected the ratio of CpG dinucleotides. Only one region with four CpG sites met the inclusion criteria and was involved in the study. The detailed information of the four CpG sites lists in Additional file 1: Table S1. CpG sites were named as their relative distance to transcriptional start site (TSS). The method of bisulfite amplicon sequencing was carried out to measure DNA methylation levels. Bisulfite conversion was performed using the EZ DNA Methylation-Glod Kit (ZYMO, CA, USA) according to manufacturer’s standard protocol, which was reported by Zhou SY et al. . The bisulfite conversion rate of each sample was ≥99% in our study and no significant difference was found between CAD and controls groups. The primers used for polymerase chain reaction (PCR) were designed by Primer 3 software (http://primer3.ut.ee/) and the information of primers was shown in Additional file 2: Table S2. After PCR amplification (HotStar Taq polymerase, TaKaRa, Dalian, China) and library construction, products were sequenced on Illumina Hiseq 2500 Benchtop Sequencer (CA, USA). All samples achieved a mean coverage of >1000X. Q30 of each sample was more than 98.22%.The calculating methods of methylation level of each CpG site and average methylation level of CpG region were reported by previous study . Normality of quantitative variables was assessed by Kolmogorov-Smirnov test. If the data was normal distribution, it was presented as mean ± standard deviation (SD) and compared using an independent samples t test; otherwise, it was presented as median (interquartile range) and compared using Mann-Whitney U test. Multivariable logistic regression was used to determine associations between CpG sites in C3 and CAD, which was adjusted for smoking, EH and DM. Subgroup analyses based on status of smoking, EH and DM were carried out. And the results were adjusted by Bonferroni correction (for average methylation, corrected P < 0.017; for each CpG site, corrected P < 0.004). Categorical variables were expressed as frequencies and percentages and compared using a Chi-square test. Person correlation analysis was used to evaluate the correlation between methylation level and lipid profiles. The haplotypes of CpG sites in C3 gene were counted directly, according to the results of detection at the CpG site on the sequencing fragment. All data were analyzed using SPSS 17.0 software package (SPSS Inc., Chicago, Illinois). A two-sided p-value < 0.05 was considered statistically significant. Table 1 shows the baseline characteristics of involved CAD patients and controls. 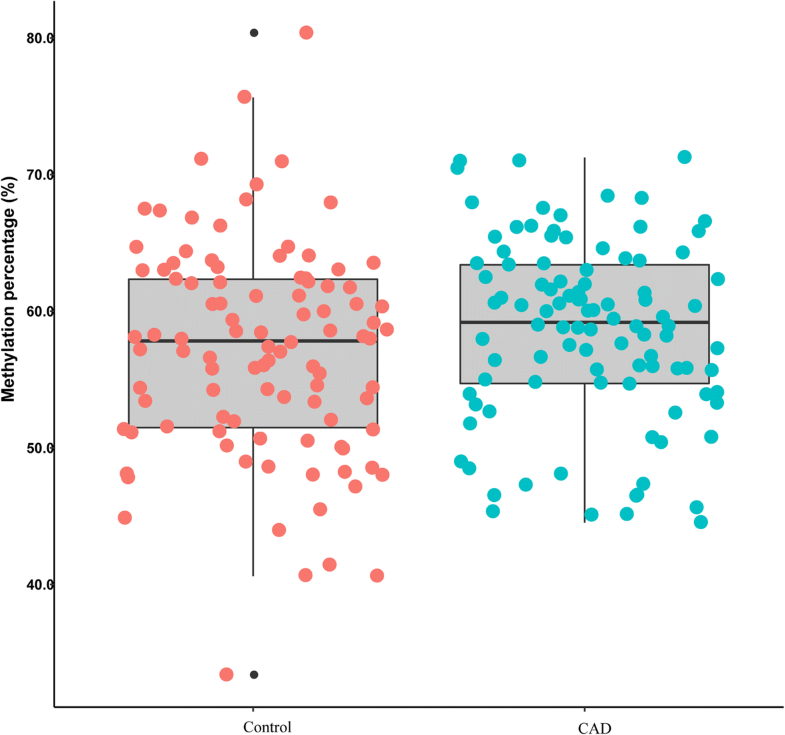 Compared to controls, LDL-C levels in CAD patients were significantly higher (2.71 ± 0.75 vs 3.04 ± 0.98 mmol/l, P = 0.009); whereas, HDL-C and ApoAI levels in patients were significantly lower than those in controls. Firstly, methylation levels of four CpG sites located at the C3 promoter locus were assessed (Table 2, Fig. 1). There were no significant difference in methylation level of each CpG site between CAD patients and controls. Average methylation rate was also calculated. 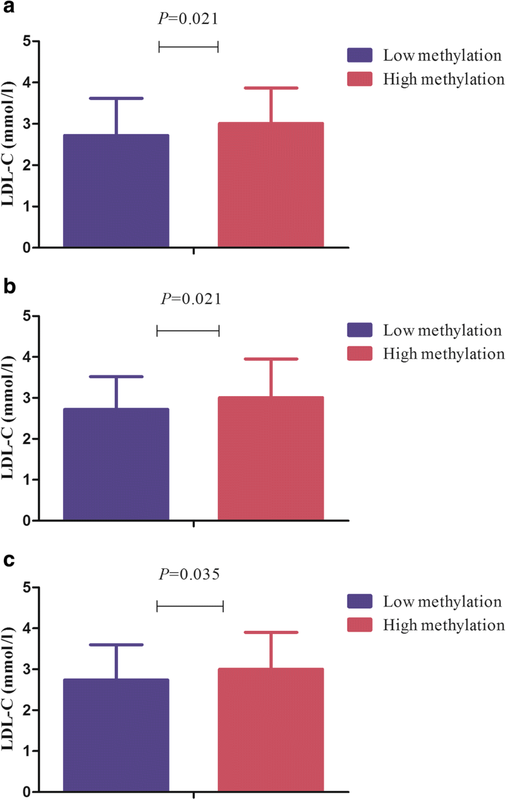 No significant difference in average methylation rate was observed between CAD and control groups (Fig. 2). CAD severity was substituted by the number of stenotic coronary artery. CAD patients were divided into three groups according to the number of stenotic coronary artery (one, two and three). There was no difference between CpG sites methylation and CAD severity (data not shown). Stratified analyses based on EH, DM and smoking status were carried out, no significant association between C3 promoter methylation levels and the susceptibility of CAD was observed (data showing in Additional file 3: Table S3-S5). Total seven haplotypes were detected (Table 3). The haplotypes were not significantly different between CAD and control groups. As shown in Fig. 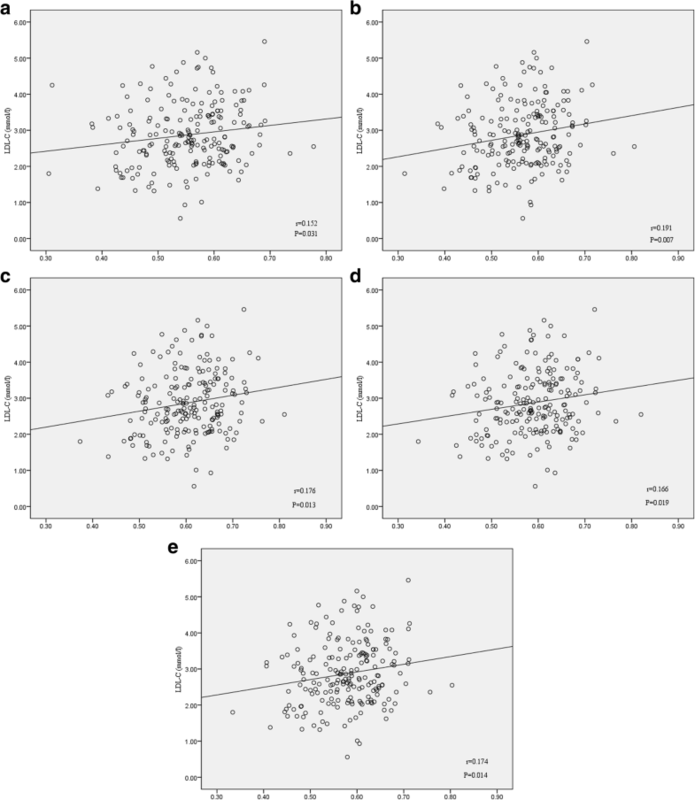 3a-e, methylation levels of four CpG sites was positively associated with LDL-C levels (site 1: r = 0.152, P = 0.031; site 2: r = 0.191, P = 0.007; site 3: r = 0.176, P = 0.013; site 4: r = 0.166; P = 0.019). Additionally, the average methylation rate was also positively associated with LDL-C levels (r = 0.174, P = 0.014). After correcting for age, the correlation remained significant. According to the median of methylation levels, patients were divided into low methylation and high methylation groups. We observed the LDL-C levels in high methylation group were significantly higher than those in low methylation group for site 1, 2 and average (Fig. 4a-c). There was no correlation between methylation levels of CpG sites in C3 gene and TC, TG and HDL-C levels (Additional file 4: Table S6). To our knowledge, it was the first study to explore the relationship between methylation levels in C3 promoter and CAD risk and lipid profiles. DNA methylation is the most common and important epigenetic modification. General speaking, when the gene promoter CpG island is in hypermethylated status, its expression is inhibited; otherwise, the expression of the gene is up-regulated. However, there is also discrepancy in the association in some genes, such as ABCA1 [4, 15], PON1 [16, 17], etc. Unlike the changes in DNA itself, many epigenetic changes are reversible, which provides an optimistic outlook for the treatment of the diseases . Environmental factors can affect the methylation of DNA promoter such as smoking , life stress , dietary , etc. For example, Park SL et al. found that internal smoking dose was associated with increased DNA methylation in circulating leukocytes at specific sites in Native Hawaiian smokers . In a cross-sectional study conducted in 5186 Australian adult participants, the authors suggested that dietary intake of one-carbon metabolism nutrients was associated with blood DNA methylation . In recent year, studies focusing on the relationship between epigenetics and CAD revealed that aberrant methylation of gene promoter might be implied in the etiology of CAD [6, 22]. As an important component of complement system, C3 may be involved in the occurrence and development of CAD by direct and indirect mechanisms. In 2018, Castellano-Castillo D et al. conducted a study to verify whether C3 DNA methylation level in adipose tissues associated to body mass index (BMI) or obesity-associated metabolic diseases . In their study, C3 DNA methylation and C3 mRNA were detected in 60 participants who were divided into three groups by BMI value and mean methylation level for seven CpG sites in C3 promoter was calculated. The results showed that C3 methylation levels were positively associated with BMI and leptin. However, no significant association between C3 DNA methylation and mRNA expression were observed. In the present study, methylation levels of four CpG sites, located upstream of C3 promoter, were measured. We failed to find an association between methylation of CpG sites in C3 promoter and the risk of CAD. Subgroup analysis stratified by EH, DM and smoking status got the consistent results. Furthermore, seven haplotypes were established and no significant difference in haplotypes was observed between CAD and control groups. Interestingly, our study showed that C3 DNA methylation levels were positively associated with LDL-C levels, although the Person correlation coefficient (r value) was relatively low. Unlike cancer samples, it is difficult to obtain coronary artery tissue. So, samples in most studies about DNA methylation and CAD were selected from blood cells . The methylation status in different tissues from the same subjects was discrepancy . The methylation level in blood cells might differ from that in vascular tissues. So, we should interpret the results cautiously. There were several limitations in this study. First, the present study was a hospital-based case-control study. The diagnosis of control was based on the result of CAG and the criteria was luminal stenosis of main coronary artery less than 50%, which might lead to selection bias. Second, we did not detect the C3 levels because of the loss of serum samples. 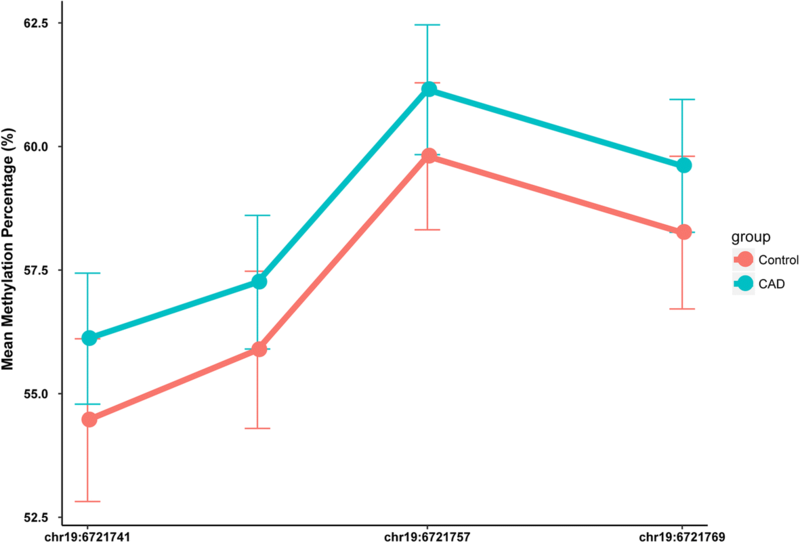 So, we did not determine whether the DNA methylation affected C3 expression. Third, only one CpG region was selected to determine the methylation of CpG sites. In addition, the sample size was relatively small in our study. Therefore, large sample and multi-center studies are needed to be performed to confirm our results. Finally, this was a retrospective study and the baseline data were consulted from the electronic medical record. Because of part of CAG images being not obtained, we could not analyze the relationship between CAD severity/degree of stenosis treated as the continuous variable and DNA methylation. Some environmental factors’ data, such as drinking dose, mental stress and economic condition, could not be obtained. Environmental factor might affect the DNA methylation, which has been well established. We could not analyze the influence of these factors on C3 DNA methylation. Well designed and prospective study need to be investigated. In summary, the present study suggested that C3 promoter methylation might not be associated with CAD risk. However, the methylation levels might be related to LDL-C levels. Gaojun Cai and Zhiying Huang contributed equally to this work. We thank all our colleagues at the Department of Cardiology, Wujin Hospital, affiliated with Jiangsu University. We also thank Genesky Biotechnologies Inc. (Shanghai) for their technical support in the sequencing. This study was supported by the Jiangsu Youth Medical Talents Project (QNRC2016310), Changzhou Science and Technology Development (CJ20160004). All authors have read the manuscript and agreed with the contents. GJC and ZYH conceived and designed the experiments; GJC, LY and LL performed the experiments; GJC and LY analyzed the data; GJC contributed reagents/materials/analysis tools; GJC and ZYH wrote the paper. All authors read and approved the final manuscript. This study was performed in accordance with the Declaration of Helsinki and approved by the Ethics Committee of Jiangsu University. All participants signed an informed consent. Xu S, Pelisek J, Jin ZG. Atherosclerosis is an epigenetic disease. Trends Endocrinol Metab. 2018. https://doi.org/10.1016/j.tem.2018.04.007 PMID: 29753613. Chamberlain JA, Dugué PA, Bassett JK, Hodge AM, Brinkman MT, Joo JE, Jung CH, Makalic E, Schmidt D F, Hopper JL, Buchanan DD, English DR, Southey MC, Giles GG, Milne RL. Dietary intake of one-carbon metabolism nutrients and DNA methylation in peripheral blood. Am J Clin Nutr. 2018. https://doi.org/10.1093/ajcn/nqy119 PMID:30101351. Fernández-Sanlés A, Sayols-Baixeras S, Subirana I, Degano IR, Elosua R. Association between DNA methylation and coronary heart disease or other atherosclerotic events: a systematic review. Atherosclerosis. 2017;263:325–33. https://doi.org/10.1016/j.atherosclerosis.2017.05.022 PMID: 28577936.